Royal Boskalis Westminster NV, Boskalis in short, is a Dutch multinational and with a turnover of more than 3 billion euros it is one of the world’s largest dredging groups. Boskalis’ main activities are land reclamation, the construction and maintenance of ports and waterways as well as coastal defence and riverbank protection. 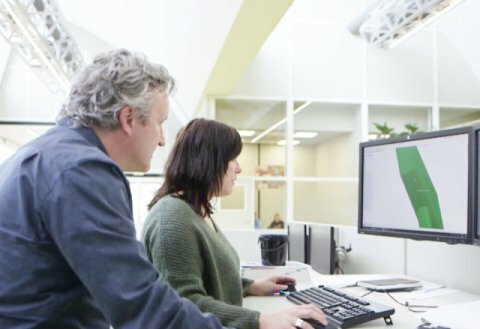 Boskalis is based in Papendrecht where the extension of its headquarter complex is an ongoing process. Boskalis is growing and a fourth office building was added to its headquarter complex in 2014. The new building provides additional workspace for 450 staff, leading to the need for more parking capacity. That is why Boskalis decided to have a three-storey car park built with spaces for 753 cars. As Boskalis aims for durability, a durable and easy-to-maintain construction out of concrete instead of steel was chosen. Concrete is solid and besides having an architectonic quality, it is fire resistant and virtually maintenance free. The surfacing material for the floors of the open-sided car park also had to meet the requirements of durability and easy maintenance. This is what brought Bolidt into the picture. Combining its knowledge and skills in car park surfacing with extensive expertise and decades of experience with surface courses on bridges and roads throughout the world, Bolidt has developed bespoke flooring solutions for each area in a car park. Solutions that are carefully tailored to the specific conditions they will be subjected to. The functional properties of the floor finish for driving lanes are thus very different from those of the flooring system for parking bays. The car park decks were surfaced with three different types of floor finish. 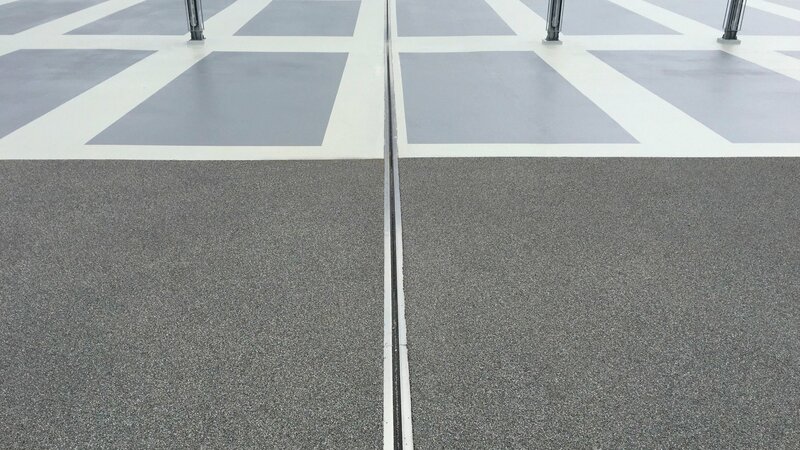 The Boligrip® W R system was installed on the driving lanes. 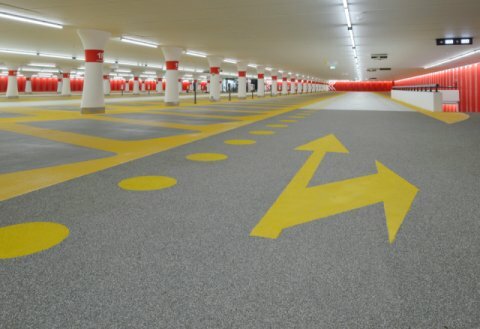 This durable and robust flooring system is perfectly suited to withstand the (high) traffic load in the car park. 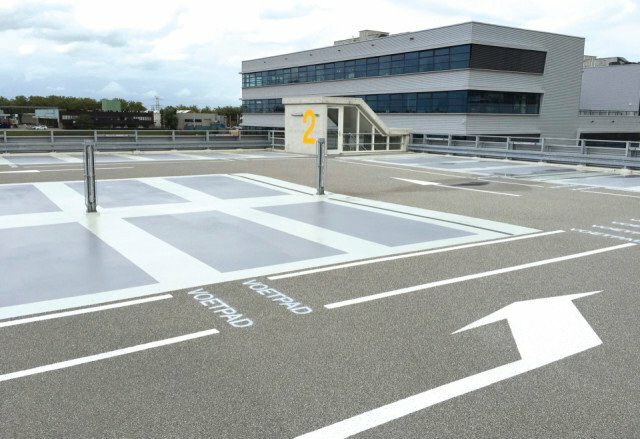 The parking bay areas are subjected to completely different kinds of stress and were surfaced with the Boligrip® 200 P system. This flooring system is not only wear resistant, but also highly resistant to the damaging effects of turning wheels, fluid seepage and corrosive substances such as road salts. An additional advantage is that it reduces the ‘squeaking noise’ made by tyres to a minimum. Finally, the durable and water draining Boligrip® W H system was used to surface the ramps. 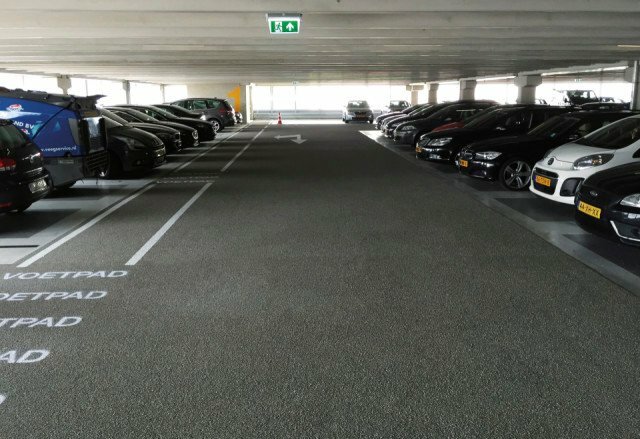 The floor finishes that were applied at Boskalis all comply with the NEN 2443 standard, consisting of a series of functional and performance requirements as well as recommendations for the design of parking facilities. Due to their long life, the systems are low maintenance and very durable. They require virtually no attention. Experience has shown that there are no specific requirements apart from regular maintenance to maintain the functional properties of the flooring. This is not just interesting from a financial perspective, but also benefits users. They will not have to face the inconvenience of maintenance work. In addition, the car park is safe for pedestrians. The floor finishes are slip resistant, minimising the risk of falls and slips.